The Dahlgren Heritage Foundation is sponsoring a tourism workshop on Monday, March 9, from 3-5 p.m. at the King George County Administration Building, 10459 Courthouse Dr., in the Revercomb Board Room. All interested businesses and citizens are invited to attend. 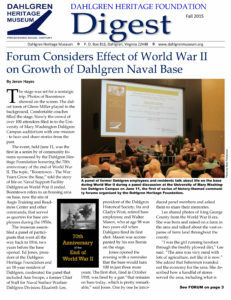 “Our goal in organizing this event is to provide a collaborative forum to discuss tourism-related opportunities that potentially could benefit both community and economic development in King George, while preserving the rural character of the county,” explains Ed Jones, president of the Dahlgren Heritage Foundation. A portion of the workshop will be facilitated by Lisa Hull with the Northern Neck Tourism Council. The Dahlgren Heritage Museum is located in the former Virginia Gateway Visitor Center on Hwy. 301 in King George, Va., adjacent to Wayside Park on the Potomac River. The street address for the museum is 3540 James Madison Hwy., King George, Va. 22485. The museum is open Saturdays from noon to 4 p.m.